The concert is part of the 60th anniversary celebrations of the Studentendorf and therefore the ADMISSION is FREE! Her stunning voice and gifted songwriting skills have made Vic a remarkable alternative artist. Her sensual songs reflect the dynamics of her emotions. Vic is an impressive performer and a charismatic presence on stage. She is the first Latvian alternative female artist that became known outside the Baltic States. Vic’s fascination with music began at a very early age. She started with traditional piano and vocal lessons, but began to write her own songs by the age of ten. Her debut album, “Trapped In A Dream” (2008), was chosen as Newcomer of the Month in Orkus! Magazine. Vic’s second album, “In My Fragile…“ (2011), brought her even more recognition and received an enthusiastic response by fans and music critics alike. Vic was also involved in several interesting co-operations with the likes of Mick Moss (Antimatter), Anneke van Giersbergen (ex-The Gathering) and Duncan Patterson (ex-Anathema) amongst others. 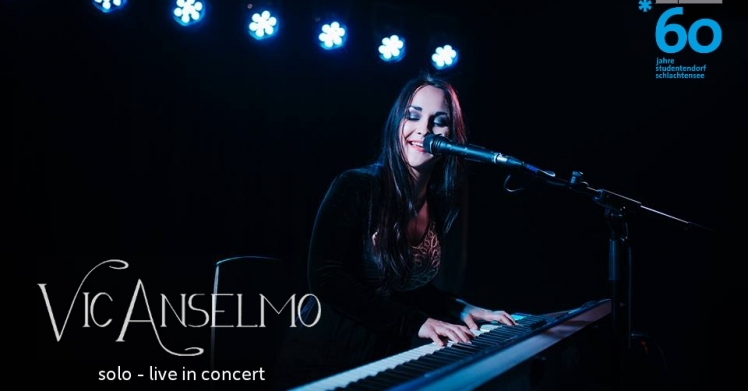 In 2013 Vic Anselmo started working on her third release. In contrast to her first two albums, Vic, and acclaimed Dutch producer Joost van den Broek, approached the recording of “Who Disturbs The Water” in a more intimate manner. The piano and vocal parts were all done as one take. Subtle additional elements like strings and percussion were recorded afterwards. The new album possesses a warmth that can be attributed to this recording setup. After leading a successful crowd funding campaign the album “Who Disturbs The Water” was released on October 2nd, 2015. On April 25, 2016, the new EP “Backyard Novelties” was released. The record is a collection of Vic’s older songs in new acoustic versions, as well as of a cover version of Kate Bush’s “Mother Stands for Comfort” as a bonus track. The EP was produced by Gijs Coolen. Currently Vik is working on producing new songs for the next album, together with Gijs Coolen, which is going to be a fully arranged conceptual album. It will be dedicated mostly to the topic of social network and modern social stereotypes, and how they are influencing every one of us these days.